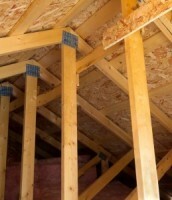 Doing any kind of attic project can be difficult and hazardous without the proper equipment. Many homes have overlooked attic spaces that are either unused or unorganized. Jimy Handy can transform your attic into by installing attic stairs or ladders for easy access along with attic flooring for safe storage. Jimy Handy can also properly insulate your attic to keep your home warm in the winter and cool in the summer, saving you money on heat and air conditioning bills while making your home more energy-efficient.